Discussion in 'Fan Fiction' started by Serin117, Jul 7, 2018. “We will not be slaves again. The quotations on the posters he’d seen pasted around the university grounds still sent a chill shooting down his spine. Of course, the students who were running the production couldn’t possibly understand why those particular words were so fearful for those of his generation. They were, regrettably, the very words Dukat had returned with when he’d brought the Dominion to Cardassia. The very words that he’d used to whip up support for what would end up being the most brutal and complete loss of life their world had ever endured. The use of those words here were, on second thought, a sign of the change that had come since those dark days. The young could never truly grasp the horror of that period and had instead taken to using the phrases as signs of hope and progress for the new Cardassia. They’d also been the words Damar had used in his final battle cry and in his dying breath, so perhaps he could forgive the university youth for their usurpation – celebrate it even. There were enough dark cultural memories clinging to the Cardassian soul already, there wasn’t a need to add more. He mused at one such poster, the figure of a middle-aged male sheltering under his arm a pale faced skinny Bajoran girl plastered on a pillar in artistically rendered tones. 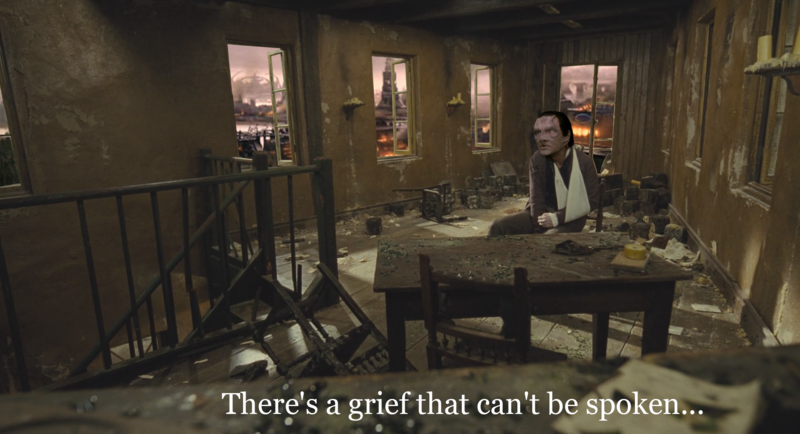 Les Misérables – A Cardassian Telling. The old man couldn’t help but be awed by it – the idea of an ancient Earth play making its way across so very much time and space to his home. He’d seen the original once in Paris in one of the only tours it had been on in decades. It had been a happy, if not reflective, coincidence that he’d been in the Federation capital for its launch. That his beloved and hardy people had prospered so fully in the decades since The Fire that they’d been able to delve not only into their own artistic history, but the history of other worlds… it was easily enough to bring tears to his eyes. Much these days was capable of doing so – he lived in extraordinary times. A Golden Age they were calling it – and indeed Cardassia’s pending application to join the United Federation of Planets made even the critics hopeful that this prosperous era would continue for generations to come. The anticipation was everywhere. Even the summer dust storms seemed to be backing off in celebration of the upcoming membership signing. Unfortunately at this very minute anticipation was all he had. It was hours until the scheduled opening of the doors and really the only thing he could think of filling the time with also filled him with a certain… inquietude. The recently finished University Library… The frightfully named recently finished University Library. And yet there was very little else to do for an old man at a University of the young. Doubly so given his preference for anonymity. He wasn’t hiding so much as at least attempting to blend into the crowd – not an entirely simple feat when the age gap between the students and he was on the order of decades. He’d already visited the memorial for those courageous few who had barricaded themselves into the grounds and buildings of the old University before falling to the Jem Hadar. He’d laid the perek flowers he’d cut from his garden and stood for a while simply mourning those youngsters… those children… who had died under the barrage of weapons fire and chemical attack. That was another thing he felt unease with – the library had been built on the reclaimed grounds where those chemical weapons had been unleashed. They’d detoxified the site years earlier but had ultimately decided to leave the grounds bare for a time before constructing something new. Another act of respect and remembrance in the longest line of such things in his worlds history. Aside from the symbolism, he was glad that they’d taken some time to consider their options – the first sketches he’d seen of a hypothetical library had been distressingly gaudy to say the least. Still, he had quite literally nothing else to do whilst waiting, as heading up into the lecture halls, labs or archives might risk leaving behind his cover… such as it was. So he turned on his heels fully prepared, at least as prepared as he could be, for the library and promptly walked straight into a student. He apologised within milliseconds as comportment demanded and immediately kneeled to pick up the texts and mask he’d sent plummeting to the brown stone walkway. When he stood up to hand the items back he was stunned. The student, an early twenty something female was quite unlike any other he’d seen, save for one, of course. She smiled, broadly. The pinkish grey ridges on her nose wrinkled slightly, a subtler giveaway than the Bajoran religious icon adorning her ear. At that moment he was doubly relieved to be wearing the dust filtering mask that almost all his people wore in the Summer months. All she could see of him was his outline and his vivid blue eyes. The mask thankfully hid most of both his sorrow and his utter joy. “Here you are, my dear. I am so very sorry for interrupting what must be an extremely busy time” he said with not even the slightest attempt to hide his… shall we say memorable manner of speaking. If there was recognition in her eyes he didn’t see it. She merely thanked him in an accent that spoke both of the Bajoran capital and of the lake district that lay several hundred kilometres north of Cardassia City, before beginning to make her way to wherever she’d been going. She bobbed her head to him as she passed, he returned the same and as she walked off she smiled knowingly, though he remained oblivious. His consciousness was somewhere else completely. Moments passed as his still-sharp mind processed. His figure still in a sea of momentum and bustle. Not one student, faculty staffer or member of the public had the kindness to perhaps accidently nudge him out of his reverie. The girl… And the young woman he’d known so many years ago played on repeat in his mind’s eye. It took a cry of joy from his left to snap him out of the daze, and after searching for the source of the excitement his eyes settled on a few students crowded around a table which held upon it some form of technology as yet unfamiliar to him. As unfamiliar in fact as the clarity with which he saw the trio – the dust that had flowed between the walkway and the grassy knoll which served as the centre point of the campus was gone. Held back it seemed in what looked like a spherical bubble around the space. He allowed himself a small chortle and set forth once more for… the library. The sections of the library weren’t aligned in any alphabetic or numerical order. Instead, amusingly, they were arranged by a somewhat generalised historical order. The cards affixed to the tops of each row end read from left to right: Lineage – The Order – Politics – War – The Fire – Reconstruction - The Golden Age and finally, Enigma Tales. The rows had before them a small pedestal, each holding a single book, evidently chosen by some brave staffer as representative of the respective sections. He recognised ‘Tain’ by Antok, ‘Watchers’ by Mevek, ‘Never Ending’ by Garan and ‘The final Sacrifice’ by Lang. He ignored them all, pacing directly to the bound copy occupying the pedestal in front of the Enigma Tales section. Taking the copy, he found a secluded and somewhat tasteful couch in a far-off corner of the large open space. Looking around he found that almost everything in the new building was at least ‘somewhat tasteful’. Though the carpet was garish. Every carpet in every library everywhere was garish. He didn’t know how the secret cabal of librarians had organised such a galactic scale feat, but if his experience was anything to go by they’d been consistently successful in their sinister plot. The couch however was a replication of a couch he’d used decades earlier, its stripes coloured in those of the Union. He sat and found it to be pleasingly comfortable. Crossing one leg over the other, he settled in for what he planned to be most of the day. With the book wedged against a knee he began to read. And by the end of the book, and also the daylight outside, Elim Garak, sitting in the Castellan Elim Garak Library, found that unlike every Enigma Tale proceeding it… not a single character was guilty. Unimatrix Q, Brennyren and Roundabout like this. I liked how you opened with that slogan and how it was co-opted to have new meaning in the new Cardassia as you wrote. Good story. You communicate a lot in such a short story, with tone, atmosphere, character, and theme well-rendered. The ending is gratifying. @Serin117 ... I've been trying to read this, but the format makes it very difficult. Could you please edit this to put blank lines between the paragraphs?? Thanks!! The idea came about after rewatching Les Mis for the millionth time. Something about the characters fits in my head. Garak as Valjean etc etc. You can almost imagine the Cardassian students adapting the play to fit with their history. Implying that the original characters are figures from their history. The audience goes in knowing that Javert represents Dukat and everything that was wrong with the old Cardassia. Thanks! Una McCormack has this annoying habit of being really inspiring with her portrayal of the dusty world. Had to see if I could play in it.